I noticed, the other day, that Copper Bird, new to Morrison Street, was just about ready to open, so I was glad to have the opportunity to visit, in what was its third week of business. 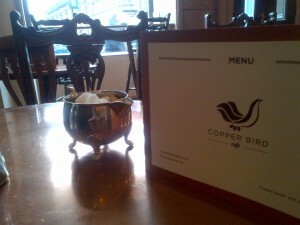 With copper topped tables, befitting its name, along with other antique furnishings, it struck me as a very intriguing little place. I called in for breakfast, and genuinely didn’t know what to expect, as while there have been a number of cafes and eateries on this stretch of shops, over the years, there hasn’t been one that’s really captured the imagination. The interior is as I’ve described already, with considerable effort having been spent on transforming the space to embody a classic feel of wood and china. Their menu for breakfast is straightforward, with breakfast rolls, Stoats porridge, and pastries. 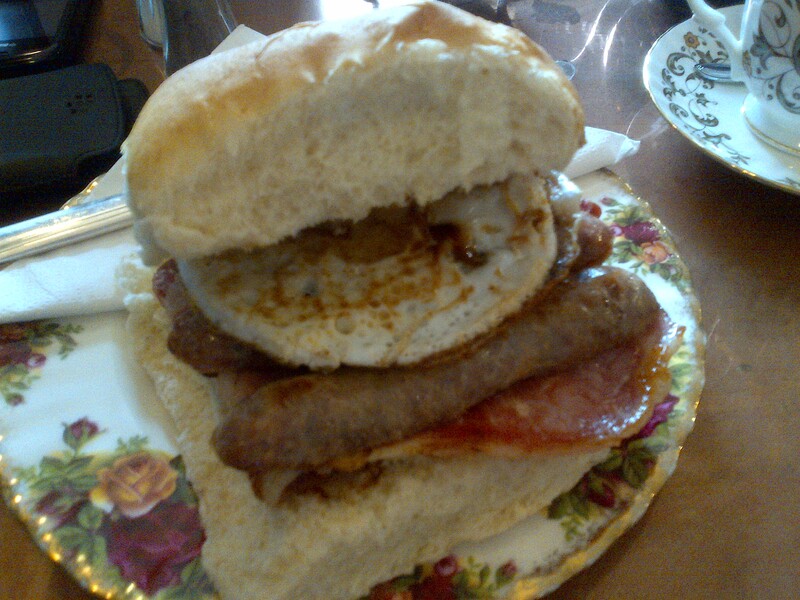 I opted for their “tripler”, which brought egg, sausage and bacon together on a roll. I added some breakfast tea, to accompany. The roll soon arrived, delivered by the splendidly lovely owner, Edel. Put simply, it was the best breakfast roll I’ve yet sampled. The first highlight was the sausages, which were immediately evident to be a cut above. The relevant question revealed that they were sourced from George Bower, the excellent Stockbridge butcher’s shop. The second winner was the egg yolk. Upon biting in to the roll, the inevitable drip of egg hit the beautiful china plate, beneath. It was the most vibrant orange yolk I’ve seen in many a while. 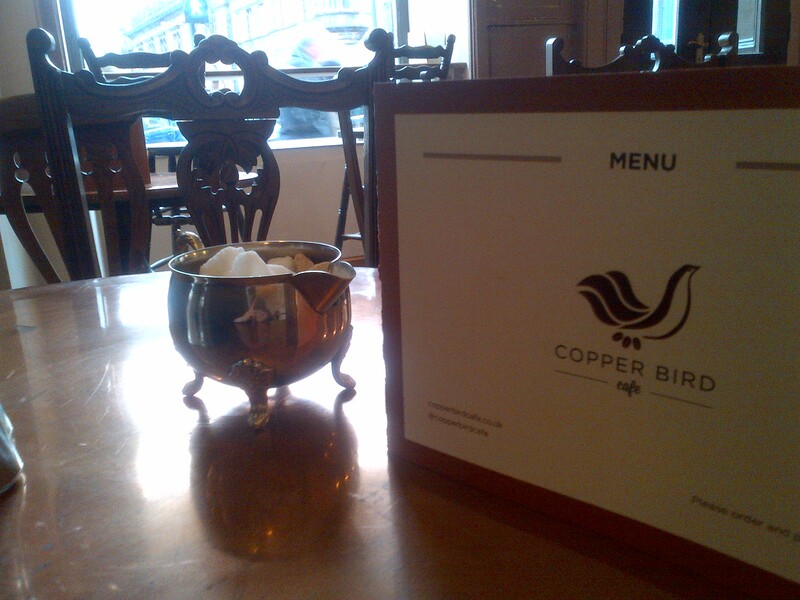 Their lunchtime menu has things on it like a daily changing pulled pork, beef or chicken wrap, with the meat again sourced from Bower’s, then slow-cooked on the premises. I can also attest to the freshness of their scones, as they were cooling on the rack, when I arrived. 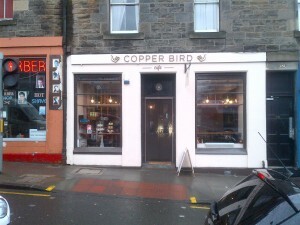 I’ll need to come back and check that their soup is up to standard, but on the basis of this visit, I was well impressed with Copper Bird. For a place starting out on its journey, they’re delivering to a really pleasing standard, already. The place is lovely, the service spot on, and everything seems to be being prepared with an impressive level of care and attention. I’d encourage you to visit soon, so you can experience for yourself its considerable charms.